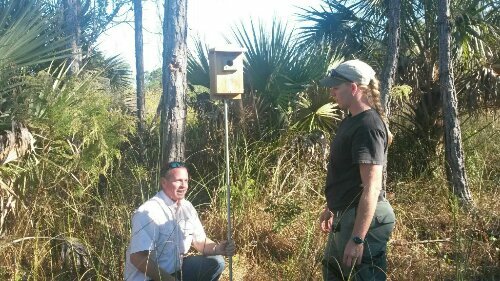 Brian Beckner, owner of Native Bird Boxes, has generously donated four new hand-crafted bluebird boxes to the CREW project and is installing them today at the CREW Cypress Dome Trails with the assistance of FWC biologist Kathleen Smith and CREW Trust Executive Director Brenda Brooks. 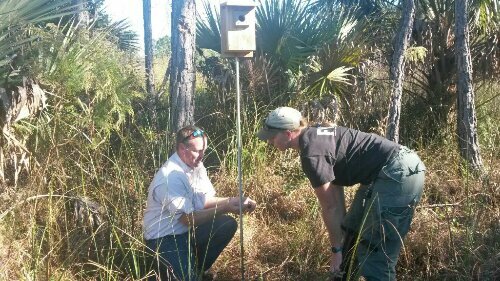 These boxes will enhance habitat and encourage bluebird nesting on CREW properties. If you’re hiking at the Cypress Dome Trails, keep your eyes open for bluebirds in the coming seasons and report any activity you see to us here or via email to crewtrust@crewtrus.mystagingwebsite.com. One Response to "New Bluebird Boxes at CREW"
It is so beautiful there. I love your phtoos because they take me places I would never get the chance to see in person. Great post and have a wonderful weekend.